This is the first page of historic value trends for Standing Liberty Quarters. Prices from 1950 to the present for individual coins of the Standing Liberty Quarter series are reported. The data is structured to help coin collectors determine which coins of this group have enjoyed the greatest value increases over time. The rarest members of the Standing Liberty type are the 1916 quarter, and the 1918/7-S overdate. Also, modern day collectors are willing to pay hefty premiums for exceptionally well struck specimens possessing “Full Head” details, for many dates. 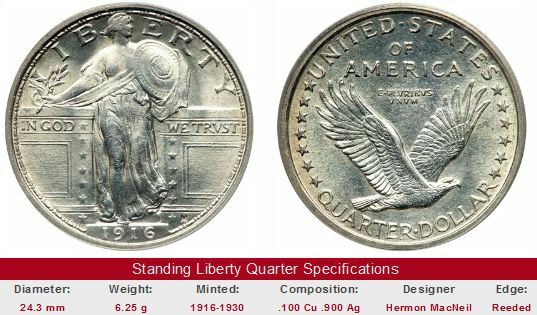 To learn more about Full Head phenomenon and other facts about this beautiful early 20th century coin, we suggest you spend a few minutes on our introductory material for Standing Liberty Quarters. You can check out what other online reports we have available by returning to the Coin Value Tables main report page, or by clicking the "Get Historic US Coin Values" in the upper right hand corner of this page. Throughout the 1980s and 1990s and into the new millennium, more grading subtleties were introduced within the framework of the grading system, including the degree of detail present in the head features of Miss Liberty on the obverse of mint state Standing Liberty quarters. To qualify for a Full Head designation, Type 1 quarters must have full details in Liberty's hair, a complete hairline along Liberty's face, a visible eyebrow and a rounded cheek. Type 2 Full Head quarters must have three well defined leaves in hair, a complete hairline along brow and across face, and a small indentation at ear. This quality is a result of sharp strikes using fresh dies, and has nothing to do with wear, as well as insufficient metal flow into the crevices of the die. These Standing Liberty quarters are designated as "Full Head" (abbreviated FH), and are more highly prized by discerning collectors/investors, and generally carry substantial premiums. The Coin Value Tables™ trend data for Standing Liberty quarters reflect the historic availability of numeric grades and the Full Head definition to describe coins. For the 1950-1985 rows, the values in the "G-4" column correspond to the "Good" listing of those years, "VG-8" corresponds to "Very Good", and so on. The "MS-60" column records the "Uncirculated" value reported during those same decades. Starting in the 1980 row, selected "Uncirculated" grades are broken down into regular and "FH" columns. Curiously, had a collector paid the "going price" in the 1970s (or earlier) for what was then a mint state Standing Liberty quarter, one that eventually earned an FH distinction, he (or she) would have been rewarded with huge price advancements as the full head phenomenon came into full vogue a few years later.